Telexpress constantly strives to make doing business with us easy and convenient. One of the ways we do this is through new technology that brings you the information you need when you need it. We understand that in today’s fast-paced business environment, having immediate and 24/7 access to your account information such as invoices, orders, and up-to-date tracking information are vital components to a successful vendor partnership. That is why we are proud to introduce a new web-based tool that will give you power and access to your account like never before - our NEW online customer portal. 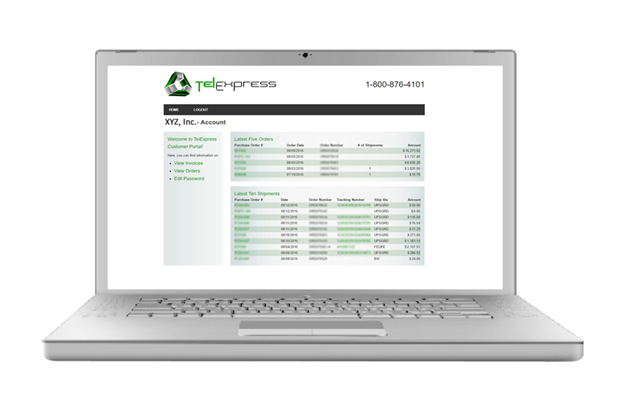 Beginning today, customers of TelExpress Inc. will be able to sign up for our new web-based customer portal. This portal will give you 24/7, web-based access to your account in real-time! Easily view your account activity from an intuitive and easy-to-navigate account dashboard. From here you can view your recent orders, view up-to-date shipping and tracking information and much more! View basic account information, i.e. account number, billing and shipping addresses, etc. If you are interested in signing up for our new portal please contact your sales rep for more information. We are excited about this new technology, and the opportunity to serve our customers better.